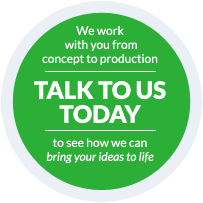 Product finishing at AKI includes five-colour CNC Tampo pad printing of text and logos onto flat or curved surfaces. 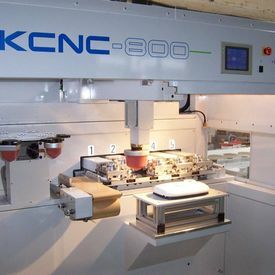 The company’s customised Kent CNC pad printing machine of Canadian manufacture is unique in Europe. This versatile and adaptable machine with fully automated three-axis handling is designed for multi-colour, multi-position printing jobs requiring high precision and exact registration. Among the features of the equipment are PLC control via a touch panel, a large printing area 350mm x 750mm and pad positioning by laser beam. Accuracy is to +/- 0.025mm. Accordingly A K Industries finds the solution ideal for printing on injection-moulded components such as domestic shower fascias, instrument panels, covers and casings, where the appearance and aesthetics of the decoration are regarded by end users as being equal in importance to the high quality of the moulding itself. To meet demands for finishing capacity, A K Industries also operates five further conventional Kent pad printing machines, comprising two 3-colour, one 2-colour and two 1-colour machines. In this case the colours are individually printed when moulded parts are pressed against the relevant position stops on the machine.